Mayflower c.1907 100+ Years Old! This is a beautiful delicate little pick! I have used Joe Macey's words & photos as his photos are better than mine and he gives a really clear description! Harry Flower named a group of instruments; mandolin's, mandola's, etc after his daughter May (or Mayon depending on historical source) going at least as far back as 1901. I am comfortable with dating this pick to be over 100yrs old because of the particular spelling which seems significant in researching the history of the name as it is associated with mandolins. 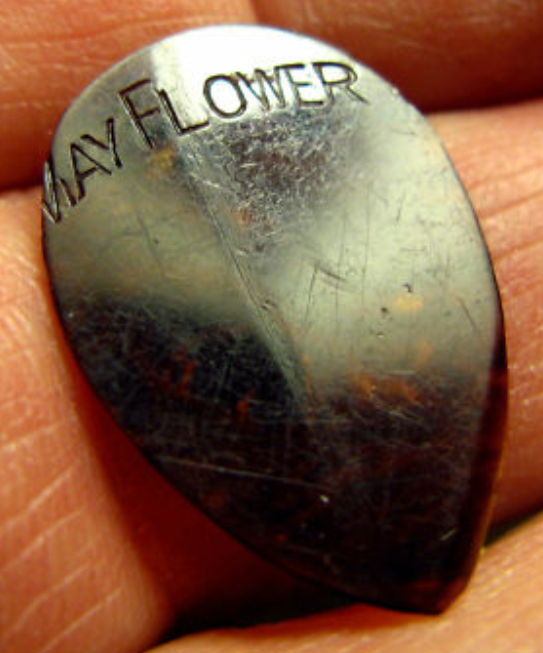 The fact that there is a space between the "May and "Flower" hand stamped no ink logo is significant because this particular spelling occurs prior to the first and last names being combined into Mayflower to form one word about 1912. This may be the oldest verifiable pick next to the Cristofaro! If your interested and desire further source information I suggest visiting the Mugwumps website or Mandolin Cafe blog. There are other sources involved in the discussion regarding variations of the May Flower name as it relates to dating mandolins with that name that you might want to consider investigating. Note in Photo 1 use of capital letter for first and last name, and space between them. Photo 2 gives a good overall impression of the surface and size. Photo 3 reveals an edge that was hand beveled at time of manufacture. 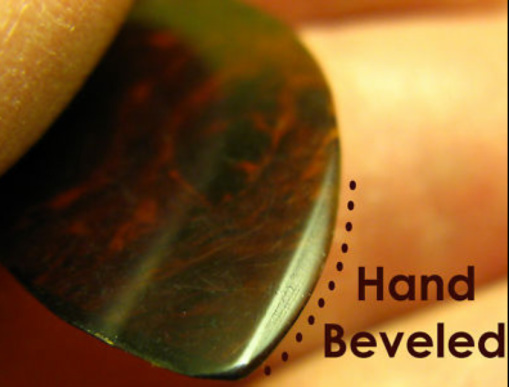 This was the only way picks from this period were beveled as tumbling to smooth the edges had not arrived yet. The luthier would literally hold the pick in hand against sanding wheel. 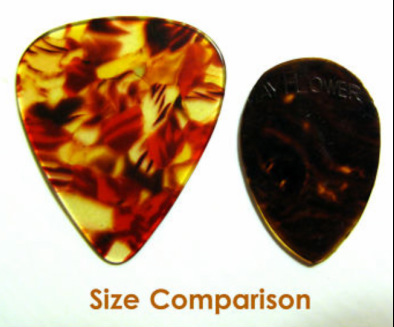 Photo 4 gives you a good idea of its small size in comparison with a standard size pick. Here are the specs; 31/32 inch long, 21/32 inch at widest point, 1/32 inch thick, material-celluloid. Unused - there are no side scratches coming off the edges that would indicate use. Imperfections: There are minor scratches on both sides. A vertical bend line runs from top to bottom through the "L" that can be seen in photo 2. I did not even notice it until putting it under a magnifying glass. Fortunately all the imperfections can be seen in the photo's provided. And lastly, my rubbish photos to show the colour/pattern more!